At this wonderful time of year we celebrate Christ coming to earth—Emmanuel—God with us. Sometimes amid all the glittering lights, festivities, and way too much food, we lose sight of the reason he came. Through studying these three documents I was struck by the enormity of the healing, which has occurred this year in Kandale. This is all an illustration of why Jesus came to earth in the first place—to restore relationships. And when I say, restore relationships, I mean first our relationship with God and second with each other. To sense the full magnitude of the miraculous healing, you also need the opportunity to read these original documents. Following is Part 1 of the story, Pastor Graber’s letter, dated March 1964. In the past weeks we have been forcefully reminded of two truths of God’s Word . . . the world will hate you (we tasted of this in our experience at Kandala) and the Lord your God has been with you; you have lacked nothing. During our ordeal with the terrorists we drew strength from the sure knowledge of His presence. All we had was swept away so suddenly, yet we have lacked nothing! Missionary co-workers and dear African friends have so graciously met our needs. Until now we have found it difficult to put our experience in writing and yet we knew that many loved ones and friends at home wanted to know about it. Now our minds and hearts are rested . . . also, we have found temporary residence after so many weeks of living in with others. When we arrived at Kandala station along with the Bertsche family and Miss Selma Unruh in mid-September we found a warm reception. 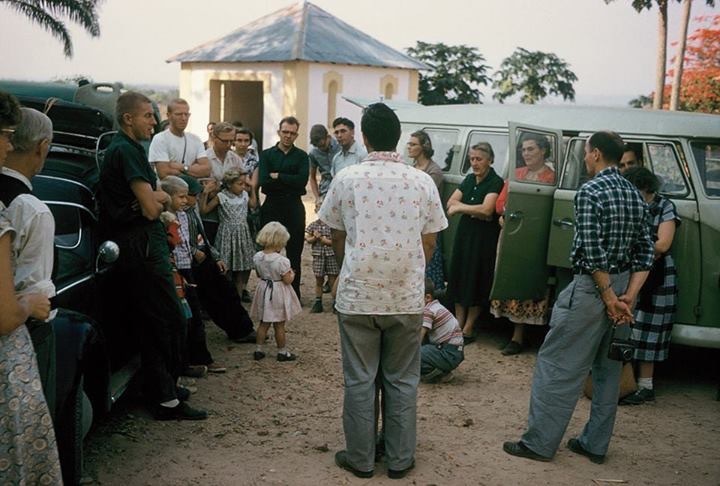 The task of re-opening this station that had had no missionaries since July, 1960, was great. So many things needed our attention. We were also opening our Bible Institute. The challenge was great. We paid little heed to the rumors reaching us of Jeunesse activities as early as mid-October. These were always at places some distance from Kandala and we were always told there was no local organized Jeunesse. Late November and December the movement was gathering momentum. We heard of school directors being killed, the police commissioner at Gungu, 35 miles away, was murdered. An attack was made on a key ferry between Kandala and Kikwit. Local government posts and chiefs were being attacked at night. The buildings were burned and many were beaten or killed. Our Bible Institute students, many of whom came from other areas and tribes, became apprehensive and asked to be evacuated. However, thus far we had heard of no move by the Jeunesse against Protestant Mission stations. The night of January 15 our local state post was burned only 2 kilometers from our station. The following day it was nearly impossible to conduct classes. Everywhere one looked on the station one saw people walking with huge burdens on their heads—they were leaving the area or taking their things to be buried in some hiding place. The government personnel were fleeing their posts. The next morning, Saturday, a truck load of soldiers came on the station asking for gas. They said they were making an inspection tour of the area. Moments after their departure our local ferry was cut and set adrift on the Kwilu River. Now our route of evacuation was cut off. We had hourly contact by shortwave radio with Mukedi and Nyanga stations. It was a very tense day. 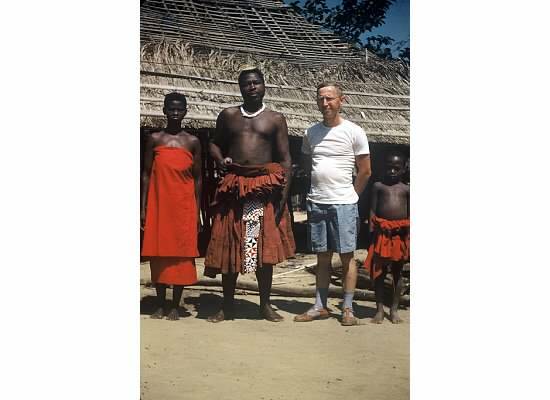 The executive secretary, Mr. Vernon Sprunger, flew over in a MAF plane (Missionary Aviation), later landing at Gungu, and was picked up by Mr. Bertsche whom we had called home from a meeting at Tshikapa. The MAF plane checked on a vital bridge which we had heard was wrecked—then dropped a note to Mr. Bertsche in the road telling him that the bridge was still intact. Sunday, Mr. Sprunger met with all of us and the Institute students encouraging us to stay, and “sit tight.” Monday night we witnessed the burning of our secteur post across the river. All one could feel these days was tension. Many people continued to move their belongings, some sent their families to distant villages, many came requesting to sleep at the missionary homes. Monday, Loyal Schmidt and Charles Sprunger arrived having had to drive a long way around to reach our station and through an area that was “hot”. Mr. Schmidt, having previously served at Kandala came to be of assistance during this difficult time, particularly with obtaining food for the Institute. Mr. Sprunger came to install a transistor transmitter, in case the Jeunesse would damage our motor used for the other transmitter. This was no time to lose radio contact! Our Institute students seemed in better spirits Tuesday. Classes went on normally. Perhaps they felt enough had been done by the Jeunesse in our area and they would move on, or perhaps they felt relieved when the pastor told us that the Jeunesse had surrounded the station the night before but their leader, a protestant, had convinced them to leave the station alone. Loyal and Charles left in the morning to take Vernon Sprunger to Gungu to meet the MAF plane. They were due back at Kandala that afternoon. They never made it. Just outside of Gungu on their return they were captured and their vehicle overturned and set afire. Being very tired after so little rest the past nights we were hoping to retire early Tuesday night. Just as we were ready to go to bed we heard shouts and cries from the nearby Christian village. Looking out we saw flames leaping skyward as all the huts were set aflame. We fled from the house. Jeanette (our youngest child) began to cry. Next-door at Bertsches we hastily decided the only thing we could do would be to go to the pastor’s home just a few yards away. By this time we heard the windows of the house and the car windows being smashed and saw near naked figures setting fire to our home. There were so many of these youths that almost everything was set aflame simultaneously. Next we saw the homes of the Institute families and the school going up in flames. It didn’t take them long to find us. As this large group of frenzied youth approached us the pastor and his wife disappeared into the darkness. She was weeping. Soon we found ourselves surrounded. Some had their bows and arrows drawn, others had large corn knives poised in the air. They shouted at us and pushed us around. They grabbed glasses off our faces and watches from our arms. Some grabbed off clothing, others hurled it back at us. They ordered us to take off our shoes as well as socks and they hacked them to pieces with a vengeance. Time and again they said, “Let’s kill them,” but always another of the group would restrain the others. The Lord brought to my mind words that I had read hours earlier that evening, Thou shalt not be afraid for the terror by night; nor for the arrow that flieth by day; nor for the pestilence that walketh in darkness. We realized, fleetingly, that God does give grace to face a martyr’s death. We thanked him and we were led to Selma’s house. This refuge was ours for scarcely 15 minutes when another group came and ordered us out, saying that we must stand trial in the village. They now proceeded to set Selma’s house aflame also. They pushed and shoved us down the path past the burning buildings. Soon two figures clad in white approached us. What a contrast they were to the nearly naked and armed warriors surrounding us! These were our two mission medical workers from the dispensary. They asked to take us to the dispensary and at first were firmly denied their request. Finally, after a long discussion, they were given permission to put us in the dispensary. Though we were exhausted, sleep was impossible. Now that they knew we were safe they went out in search of the Institute families. Soon they came back to let us know they had found them all. As morning dawned one by one the students came. They were unable to speak, but their tears and the expressions on their faces spoke volumes. A new bond had been formed between all of us. Christian friends ministered to our needs in every way they possibly could in the next three days. This was a new experience . . . having them serve us! When other stations could not contact us by radio they knew something was wrong and MAF was alerted to fly over the station. Meanwhile, we were much concerned about Charles and Loyal. Wednesday night in the midst of a pouring rainstorm the dispensary door burst open and a crowd of Jeunesse came in. Among their group were Charles and Loyal. What a relief to see them! They were stiff and sore having had to travel some 30 miles on foot with their hands tied behind their backs. Thursday morning, quite early, MAF flew over. The pilot was able to radio from the plane directly to Leopoldville. The Embassy there had already been contacted. He dropped two notes to us, first asking us if we could make an emergency landing strip. Since no Jeunesse authority was immediately available to ask permission, we could not answer the pilot. Then he asked us to sit on the ground if we wanted a helicopter. This we did as we felt it was our only means of rescue. When the plane left several Jeunesse leaders approached us immediately and tore at our clothing wanting to find the tiny transistor that had called the plane. Patiently we explained why the plane had come. We asked permission to make the airstrip and it was granted. They thrust hoes into our hands and ordered us to make it ourselves, forbidding the Institute students to help us. However, after we had cleared the first 100 meters they did allow the students to help us complete the other 200 meters. When the airstrip was completed, we sat down to wait. We fully expected rescue before nightfall. More youths were arriving on the station grounds all the time. We felt we could not endure another night. What if soldiers should arrive? They had told us countless times that if soldiers came we would be killed instantly. They also told us that if any soldiers came on the planes coming to get us we wouldn’t be allowed to go and all would be killed and the plane burned. Once again, we had to patiently explain to them what we were doing and gain their approval as we took rolls of bandages and laid out a large sign both in English and French to warn the pilots of their threats. The sign read: OK TO LAND. PILOT ONLY, NO GUNS, SOLDIERS, SAFETY ASSURED. Nightfall came and no plane. It seemed we couldn’t bear another night in that place. The Lord brought to my mind and heart the words, Be still and know that I am God. The area president of the movement was now on the station and he assured us that no harm would come to us through the night. He even posted a sentry outside the dispensary so groups wouldn’t disturb us as they had the other nights. The next day, Friday near noon we heard the welcome sound of UN helicopters. What a relief it was to get on board without incident and be on our way to Tshikapa where our fellow missionaries were anxiously awaiting our arrival. We shall always be grateful to the UN who so nobly came to our assistance. However, our UN friends had only just begun their rescue work in the Kwilu. Many missionaries were in grave danger and there were many stations where rescue was not performed as easily as at Kandala. Tragically, at Mangungu two brave ladies signified they wanted an airlift, but the UN arrived too late. When we were safely deposited at Tshikapa the UN planes returned to airlift the Institute families. However, the families had all started out by foot feeling they just couldn’t wait for the planes to return. Wayindama, one of the Kandala pastors (look for more information about this dear man in the next post) accompanied them on their five-day trip through this hostile area to the Luange River. The Lord was with them in a wonderful way. When they had safely crossed the Luange River after many hazardous experiences they sat down together for a Praise and Prayer Service, singing hymns and reading from the book of Joshua. The pastor then bade them goodbye and returned whence he had come. Let us pray for him and all the dear Christians in the Kwilu. We are grateful that God’s grace is sufficient. We are grateful for the gift of life and for His divine protection over our lives amid the forces of evil. We are grateful for the serenity He gives in times of peril. We are grateful for the Holy Spirit, His comfort, His guidance, and for the counsel and comfort of fellow believers, many of them Congolese. We would rest in the sure knowledge that our future is in His care. We would trust Him to guide us in the decisions we must make. We would ask of Him, grace to follow Him step-by-step, and day-by-day, rather than clamoring to know the end from the beginning. May we know that He will withhold no good thing for we are heirs of God and joint heirs with Christ. Please join us this coming Wednesday for the story of Pastor Emmanuel Wayindama.